This universe emerged from OUBEYs overwhelmingly fertile legacy and started with a kind of “not knowing what will happen”, just following and sticking to the track that OUBEY himself had consequently followed throughout his short life. “Everything is connected with everything” OUBEY once said. Though every single step and activity of the MINDKISS Project stands independently for itself, it also stands “pars pro toto”. All of them together make up a whole where every piece is connected to every other piece in a way. The complete ensemble represents complexity with all its qualities and challenges. It´s based on clear radical principles, consequence and patience on the one hand, and driven by its radical open-mindedness and interest in the creative contributions by others worldwide. 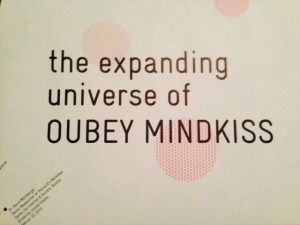 Using the internet as main communication channel for the presentation of OUBEYs art, MINDKISS became an interactive, intercultural and experimental global platform, gaining a constantly growing community and developing more and more self dynamical power. 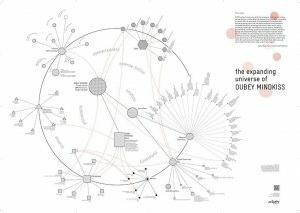 If you want to know more about the foundation from which OUBEYs work derived, please click the link below and view the 4 minutes short film “OUBEY Complexity”. Perhaps paradise hasn’t been the dream of all peoples at all times throughout history. But it is certainly one of humanity’s oldest and most enduring dreams.